Mike Mangal blazed the golf course at Lusignan to win last Saturday’s Macorp Medal Play Golf tournament in an electrifying performance. 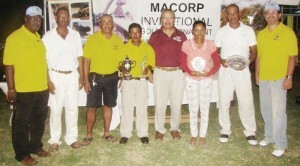 The former Guyana Open champion shot a net 63 and also had the lowest gross of 73 in the tournament that attracted 38 players including employees of the sponsors Macorp. Mike Mangal winner of the tournament (fourth left) with Macorp Managing Director Jorge Medina along with other top performers and officials of the Macorp. Muntaz Haniff continued his impressive run this season in taking the second position with net score of 67, while Canadian Roger Rajkumar was third with net 68. The Ladies Best net was won by Joaan Deo, while Nearest to the Pin was Clifford Reis. 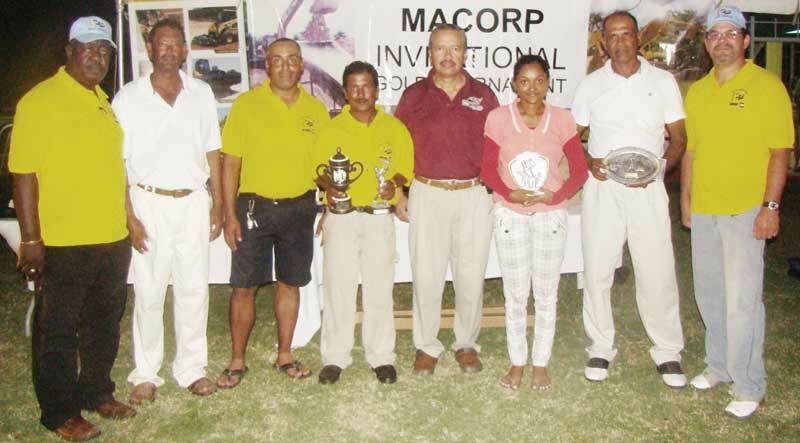 Vice President of the Lusignan Golf Club Patrick Prashad said that Macorp continues to set trend in its sponsorship which not only benefits members of the club but also the Lusignan community. He thanked Managing Director of Macorp Jorge Medina, an ardent member of the LGC, for his continued support to the sport locally. Medina said that his company was always willing to work closely with the Lusignan Club and promised to sponsor the tournament again in 2012. Macorp also presented a cheque for $200,000 to the LGC. All the participants were presented with gifts following a raffle. Photo caption: Mike Mangal winner of the tournament (fourth left) with Macorp Managing Director Jorge Medina along with other top performers and officials of the Macorp.